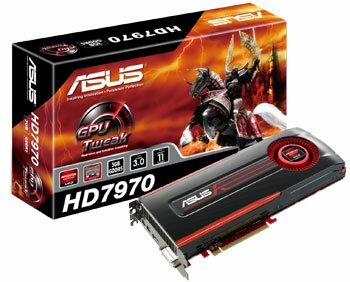 ASUS also released a Radeon HD 7970. Frequencies are same as the reference model, a 925MHz core and 5.5GHz memory. An efficient and powerful 28nm GPU coupled with 3GB of GDDR5 delivers gamers and video enthusiasts with the most capable graphics card yet. The ASUS HD 7970 ships with the exclusive GPU Tweak utility for real time and intuitive tuning and overclocking. It offers the best platform for enhanced DirectX® 11 gaming and genuine next generation PC graphics output, enhanced by the inclusion of new PCI Express 3.0 and AMD Eyefinity™ multi-screen technology. To fully harness the power of new GPU technology, ASUS is including the exclusive and updated GPU Tweak utility with all cards shipped. The suite allows users to modify clock speeds, voltages, and fan performance, working on up to four cards ― perfect for CrossFireX™ setups. Standard and advanced modes available to catering different user experience segments. ASUS GPU Tweak features effortless modifying and overclocking with GPU clock and voltage syncing, plus 2D/3D switching and mode locking to ensure higher 3D mode benchmarks, resulting in more accurate system testing and higher scores for competitive overclocking scenarios. The utility offers auto driver/BIOS version updates to keep cards in optimal working condition, and a handy monitoring widget that provides highly detailed multi-parameter information on demand. ASUS has also worked closely with Techpowerup to integrate their renowned GPU-Z program into GPU Tweak, offering even more reliable graphics card data and tracking. Also eagerly awaited by gamers and PC enthusiasts, PCI Express 3.0* arrives as the standard interface for the ASUS HD 7970 graphics card, doubling the data bandwidth of PCI Express 2.0. This development lays the foundations for radically improved performance, as graphics cards can communicate with the overall system at much higher data rates than previously available. The power of the ASUS HD 7970 graphics card also makes AMD Eyefinity™ multi-screen technology much more effective, enabling up to six-screen viewing at once for a vastly expanded display. Users from gamers to professional graphics designers are sure to appreciate the smoother and more consistent AMD Eyefinity™ performance offered by the ASUS HD 7970 graphics card.